Love this! 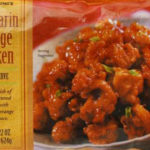 I like that the smokey flavor of it is subtle and it’s not loaded with salt, yet still delicious. 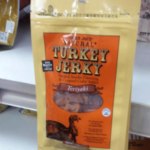 My family loves this – it’s great in omelettes, too. GARBAGE – VERY DISAPPOINTED. 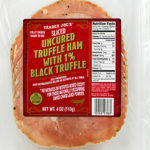 I BOUGHT IT ON MONDAY AND LAST NIGHT TOOK OFF THE FOIL AND NET WRAPPING TO LOOK AT THE HAM. IT WAS A BALL OF FAT. I THREW IT OUT AND AM GOING TO GET MY MONEY BACK TOMORROW. I CALLED THE STORE AND SUGGESTED THAT THEY CONTACT THEIR SUPPLIER. HAPPY THANKSGIVING – NO HAM HERE. 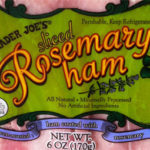 This is now my favorite ham. I didn’t use the glaze. I probably would if serving to guests. 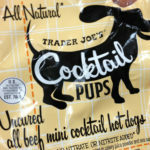 I tried a sample in the store and was hooked. We have had it heated up with veggies on the side. We have had it on salads. And we have had it as a snack with gluten free crackers. 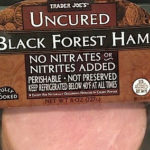 Not too salty like most hams I’ve tried. Not too sweet. Just the right amount of smoked flavor. 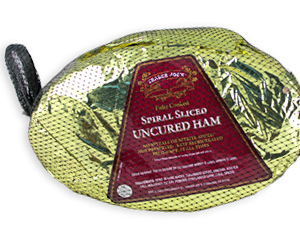 After hearing how good Trader Joe’s spiral hams were we raced to the next town over to grab one for ourselves. We purchased the 1/4 spiral cut ham, and after glazing and cooking, the ham was dry and rubbery. No ham flavor just a mouthful of salt. So disappointed that THIS was our holiday dinner. Never doing ham again on a holiday. Not worth the risk! To add to this disaster, the cornbread stuffing was wet and soggy. And this is after using only half of the recommended liquid called for on the box directions. It would best be described as completely tasteless. Definitely not cornbread, more like styrofoam. Always have gotten my Christmas ham at TJ. This year it was disgusting. Tasted like it was cured in Cinnamon. I couldn’t make anything with the leftovers because of the strong sweet and cinnamon taste. What a waste of money. Out of 14 people, only 2 liked it. Also it was full of fat. Gross.